The free train service from Iju in Lagos to Abeokuta which was declared by the Federal Government on February 11 after the section was test-run only operated for two weeks before it was suspended. 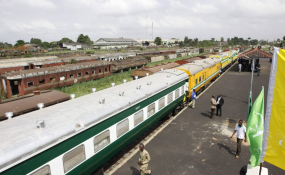 The Nigerian Railway Corporation (NRC) suspended the service amidst disappointment by passengers. However it was learnt that the suspension was at the instance of the China Civil Engineering and Construction Company (CCECC), the contractor handling the 156-kilometer Lagos-Ibadan standard gauge project. A source told Daily Trust the CCECC team pushed for the suspension for safety reasons as the project was still ongoing. Beside the CCECC felt the service was stalling the progress of work at a time the government was pressurizing it to deliver the project on schedule. "Don't forget the CCECC people are still using the route to move their equipment to site and this could be significantly stalled if we continue to run the service on the lone line. We can do this by the time we finish the second line", the source said. Daily Trust reports that about 2,500 passengers were transported within the period the service was run. The Iju-Abeokuta end of the project covers about 62 kilometers from KM 21 to 82. Minister of Transportation, Mr. Rotimi Amaechi who inspected the project last week also confirmed that the free train service was suspended by the CCECC while apologizing over the suspension. He said, "The excuse they gave me was that they cannot allow it run because of safety since they have not completed the second line but they are almost through with it. It is almost completed from nearly Iju to Abeokuta. I want to apologise to Nigerians that they suspended it... which I didn't envisage".